So, I'm always looking for great meal ideas, especially for a family that is so painfully divided in what we eat. Last night for dinner I made oven fried chicken for my non-vegetarian husband and son, cheese tortellini with mushrooms and peas as a side for them and a main course for my vegetarian daughter and me, and steamed baby brussel sprouts with butter and a sprinkle of Parmesan cheese for everyone. Lauryn and I had bowls of pasta with brussel sprouts on the side. The sprouts were especially delicious slightly dipped into the creamy pasta sauce. My hubby only had chicken and pasta because he didn't "want" brussel sprouts. I think "he thinks" he doesn't like them but they taste just like cabbage and he eats that with no problem. But I digress. My son, who really only likes noodles, pizza, hamburgers and bacon, ate a little bit of pasta. And that's all. But I did find a winner yesterday as well. For lunch I made tomato pesto sandwiches. I wish I could take credit for the idea but it actually came from the cafe at Barnes and Noble, where Lauryn and I spend a significant amount of time noshing, drinking and reading our Nooks. Their sandwich, called the Roasted Tomato Caprese, is pretty simple: Sliced mozzarella and provolone cheese with basil pesto and slow roasted tomatoes on an Asiago basil focaccia roll. Trust me, these are delicious. In my home (kid-friendly) version, I substituted the roasted tomatoes with freshly sliced ones and used only mozzarella cheese (although I will probably add different ones in the future) and I served them on 100% whole wheat bread. 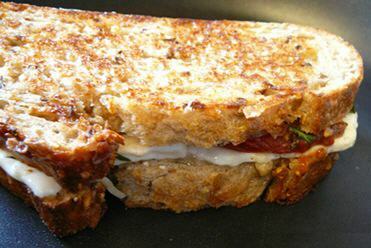 Lightly buttered and then grilled until the cheese is melted, these sandwiches were a hit at our house. So much so that my son (who saw me adding pesto and became a little weary until I told him it was really just a "pizza sandwich") asked to take one to school today for lunch. Boy, that felt like a huge win! I’ve never been very good at packing lunch. First of all, my office is always freezing so the idea of a hot lunch is always appealing. I drink coffee and tea all day long just to keep my insides warm. So when Lauryn suggested, as part of our dive into vegetarianism, that we buy Tofurky (for those of you not familiar, it is turkey-flavored tofu. I know… sounds delicious!) I was slightly hesitant. Ok, I was two aisles away when she convinced me to go back and take another look. 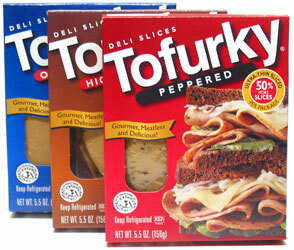 For some reason, I pictured myself having to slice pieces of Tofurky from a giant, gelatinous loaf for our lunches. It wasn’t that way at all. In fact, the package looks pretty much like Oscar Mayer or Butterball and the “turkey” was pre-sliced. All-in-all, I would give Tofurky a great rating! And, let’s face it; it’s even fun to say! When Lauryn came home from school yesterday, I asked how her lunch was. She said she loved it and took the same sandwich again today. We seem to have a winner! Recently my peace-loving, environmentally conscious twelve year old declared that she was giving up meat after a decidedly "traumatic" shopping excursion. "As of today, I'm a vegetarian!" "Really?" I said. "That means no more burgers, ribs, chicken, cheesesteaks..."
"I know. 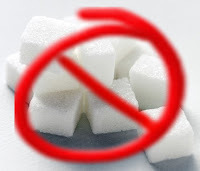 I don't want to eat them any more." "Ok, but that means giving up sushi." After a moment... "Ok, maybe not fish!" "Well," I replied to her supportively, "if you're serious, I'll do it with you!" So that's how we got where we are today: Pescetarians! This didn't just come out of the blue. Lauryn has always been a very "conscious" person. Sensitive to animals and people's feelings (except her brother's of course! ), very kind and considerate when it comes to other people. She's a very sweet girl. All of her clothing designs (website coming soon!) are accented with the peace sign. So, really, in my mind, it was just a matter of time until we got here. And here's the thing... I've gone (red) meatless for years with no problem. Unlike my husband, I don't "love" steak and probably wouldn't order one in a restaurant unless it was that restaurant's specialty (such as Arthur's Tavern in Hoboken or The Steakhouse at Circus Circus in Las Vegas.) It's something I can easily live without. Chicken will be a bit harder to give up but, honestly, we both love tofu and all kinds of seafood so I think we'll be all right! And, it's much healthier in the long run! And, let's face it, Lauryn and I both need to drop a few pounds. Hopefully, this will lead to more healthy eating overall. We are also protesting fast food (as much as we can - but sometimes a baked potato from Wendy's can make an inexpensive and satisfying meal!) and getting out to get more exercise. I'll check back in often with our progress (yes - both the satisfying highs and the embarrassing lows!) Here's hoping there will be very few lows! Any ideas or suggestions on great boxable lunches or tasty homemade meatless dinners would be greatly appreciated. Drop me a line if you have a delicious recipe that you're willing to share! Thanks! I finished The Jester last week while on a wonderful beach vacation. Because I am a big fan of James Patterson, I was very surprised about the premise for this story. 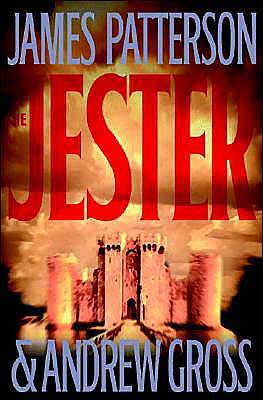 I know what a Jester is but, for some reason, I thought maybe The Jester was just a code name for a crazed killer rampaging Washington DC in typical Alex Cross-novel style. The Jester is actually about... well... a court jester during the Crusades. It was actually a very good story. And, although I would like to say that it was "a lot of fun" to read, it really wasn't. The story is very adult in nature; definitely not for the kiddies. There is quite a bit of sexual reference, lots of crude jokes and lots and lots of extreme violence. So while fun wouldn't be a good word, I still didn't want to put it down. The beginning of the book is out of place and unnecessary. It starts in the present but the remainder of the book flashes to the past and never returns to the present. Although the book's end explains what happens in the prologue, it was a weird transition that added to my initial "period piece confusion." But once I was in the correct time period, I really enjoyed the story and was able to picture the action from the very descriptive text with no problem. Hugh De Luc, the main character, was very sympathetic and extremely likable. I found myself rooting for him from the very beginning of his quest. So, while I probably wouldn't recommend this book to huge fans of chick lit and romance novels, I would recommend it to fans of historical dramas and fantasy novels. For mature audiences only. Not for the young or faint of heart!